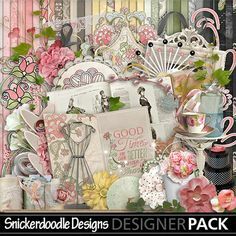 Today Karen asked me to choose a favorite from her shop and show you layouts created using the collection. Trust me, it wasn’t easy; but it’s my job so I present to you inspiration using the collection Color Outside the Lines. As always the collection is packed. I love the hand-drawn figures and the word art which includes some awesome quotes. This collection is perfect for your artwork from a child’s simple drawings to your more complex artistic endeavors. I could continue; but instead I’ll show you just a few layouts demonstrating the versatility of this collection. I love this artsy page, Freedom, from judy in SD. 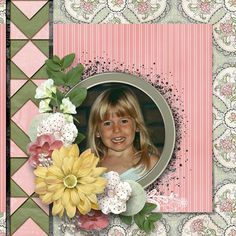 This collection makes it easy to create an Art Journal page. The word art includes the paint, butterfly and quote. It’s the perfect foundation for the page which is completed by adding paper, additional paint and just a few elements. I really like the split framing in Budding Artist by kabrak. Placing the crayons diagonally across from the banner moves the eye to the center of the layout where the photo is the focal point. I love the cluster, which includes hand-drawn and realistic flowers. The scribbled background is prefect for her theme. Sometimes you get lucky and you have photos that match a collection perfectly. That’s definitely the case in Happy at the Beach by Norma. She also used split framing, but it looks completely different here, vertically oriented and with smaller photos, one per frame. Her clusters are gorgeous, and I really like the way she shows only three of the watercolor paints, retaining her color scheme. The word art completes the layout perfectly. Johnny by Ozegirl is an amazing page. I really like the monochromatic look with the red crayon which appears to be signing the artwork. The black squiggle pops, and I love the extreme shadowing on the frame bordering the actual artwork. The newsprint edger, also re-colored to match, frames the layout perfectly. I really love the layout design in Sisters Forever by PamR. The borders are so pretty. I like the framing and the slight tilt to the photo, as well as the gorgeous clustering just below and behind the photo. 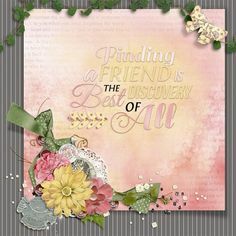 If you like this layout as much as I do, you can scraplift it now by participating in the Scraplift Challenge at TDC. Did you miss this freebie when it was previously offered? Karen has made it available for you again! 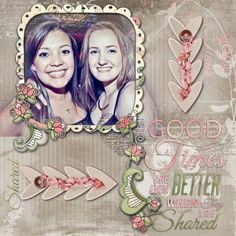 This gorgeous clustered frame was created for you by Renee. Just click on the image below to download. I hope you have enjoyed my post and that I have inspired you. Thanks and have a great week! This just happens to be one of my favorites too! Thank you for the inspiration for using it. Love, love, love this collection. I love this collection, too! Thanks for sharing the beautiful cluster frame!